Download "Internet Banking Recommended Browser Settings. Internet Explorer Versions 10 and 11 Settings. Choose Your Browser Below. Cookies." 1 Internet Banking Recommended Choose Your Browser Below Internet Explorer Versions 10 and 11 Settings Cookies 1. To properly access Online Banking solutions you will need to enable first- and third-party cookies. 2. Open your browser, click on TOOLS (also known as Gear icon). 3. Select INTERNET OPTIONS. 4. In the GENERAL tab, under the heading Browsing history, uncheck the 'Delete browsing history on exit' checkbox. 5. Click on the PRIVACY tab. a. Click the "Advanced" button. b. Put a check mark next to "Override Automatic Cookie Handling". c. Accept 'First-party Cookies' and 'Third-party Cookies'. d. Put a check mark next to "Always Allow Session Cookies". e. Click the OK button. Security 1. Open your browser, click on TOOLS (also known as Gear icon). 3. Click on the SECURITY tab. a. Set the Security Level for the Internet Zone to Medium-high. (if slider bar is not available, click on the button "Default Level"). b. Click the OK button. 4. Click on the PRIVACY tab. a. Set the Privacy Setting to MEDIUM. (If slider bar is not available, click on the button Default ) 5. Click on the ADVANCED tab. a. Under Security make sure the checkbox for "Do not save encrypted pages to disk" is blank. b. Under the Security Section, only check Use TLS Click on OK until exited completely from options. 7. Then close all browser windows (resets the IE10 browser settings) and start up the browser again. 2 Additional information Deleting All Temporary Internet Files and Cookies: WARNING! MFA Impact - Doing this will cause an end user to be challenged at log in on an authorized computer. 1. Open your browser, click on TOOLS (also known as Gear icon). 3. Click the GENERAL tab. 4. Under Browsing History, click the 'Delete...' button. 5. In the Delete Browsing History popup window, put a check mark next to Temporary Internet Files, Cookies, and Preserve Favorites website data. User may decide whether to put a check mark in all other boxes in this window. 6. Click on the 'Delete' button at bottom of popup window. 7. Click on OK until exited completely from options. Internet Explorer 9 Settings If your Browser Test Utility states that you are using Internet Explorer 7 and you know that you are running IE 8 or IE 9, you may be running in Compatibility View Mode. To turn it OFF, click Tools icon in the menu bar then click on Compatibility View mode in the drop-down list (it s a toggle switch). If the checkmark disappears in the menu list, then Compatibility View mode has been shut off and your browser version should now display correctly whenever you check it. Cookies If you are using Internet Explorer 9, you may be deleting your cookies automatically and will need to change that setting in order to more easily access online banking (skip entering the verification code). 1. On the General tab, click on TOOLS. 3. Under the heading Browsing history, uncheck the 'Delete browsing history on exit' checkbox. 4. Click on the PRIVACY tab. a. Click the "Advanced" button. b. Put a check mark next to "Override Automatic Cookie Handling". c. Accept 'First-party Cookies' and 'Third-party Cookies'. d. Put a check mark next to "Always Allow Session Cookies". e. Click the OK button. Security 3. Click on the SECURITY tab. 3 a. Set the Security Level for the Internet Zone to Medium-high. (if slider bar is not available, click on the button "Default Level"). b. Click the OK button. 4. Click on the PRIVACY tab. a. Set the Privacy Setting to MEDIUM. 5. Click on the ADVANCED tab. a. Under Security make sure the checkbox for "Do not save encrypted pages to disk" is blank. b. Under the Security Section, only check Use TLS Click on OK until exited completely from options. 7. Then close all browser windows (resets the IE9 browser settings) and start up the browser again. Additional information Deleting All Temporary Internet Files and Cookies: WARNING! MFA Impact - Doing this will cause an end user to be challenged at log in on an authorized computer. 3. Click the GENERAL tab. 4. Under Browsing History, click the 'Delete...' button. 5. In the Delete Browsing History popup window, put a check mark next to Temporary Internet Files, Cookies, and Preserve Favorites website data. User may decide whether to put a check mark in all other boxes in this window. 6. Click on the 'Delete' button at bottom of popup window. 7. Click on OK until exited completely from options. Internet Explorer 8 Settings If your Browser Test Utility states that you are using Internet Explorer 7 and you know that you are running IE 8 or IE 9, you may be running in Compatibility View Mode. To turn it OFF, click Tools icon in the menu bar then click on Compatibility View mode in the drop-down list (it s a toggle switch). If the checkmark disappears in the menu list, then Compatibility View mode has been shut off and your browser version should now display correctly whenever you check it. Cookies 3. Click the PRIVACY tab. 4. Click on the ADVANCED tab. a. Put a check mark next to "Override Automatic Cookie Handling". 7 7. Click on OK button to close the Options window. Deleting the Cache: (a.k.a. Temporary Internet Files) 1. From the menu bar, click on "Tools." 2. From the T ools menu, select "Options." 3. In the Options window, select the "Privacy" icon. 4. If the "Firefox will" option in the dropdown is "Remember history," click on the "clear your recent history" link in the dialog box; if the "Firefox will" option in the dropdown is "Never remember history," click on the "clear all current history" link in the dialog box. 5. In the "Time range to clear" dropdown option, choose "Everything". 6. In the "Details" section, expand the selection (if necessary) by clicking on the down button 7. Ensure that "Cache" is the only option selected and click "Clear Now". 8. Close the "Options" box by clicking "OK". Deleting Cookies Only: 1. From the menu bar, click on "Tools"". 2. From the Tools menu, select "Options". 3. In the Options window, select the "Privacy" icon. 4. If the "Firefox will" option in the dropdown is "Remember history," click on the "clear your recent history" link in the dialog box; if the "Firefox will" option in the dropdown is "Never remember history," click on the "clear all current history" link in the dialog box. 5. In the "Time range to clear" dropdown option, choose the date range that is most appropriate; please note that this will delete all cookies for the user for the given timeline regardless of site. a. Selecting "Today" should help clear cookies related to a user's session b. Selecting "Everything" will remove all cookies in the browser 6. In the "Details" section, expand the selection (if necessary) by clicking on the down button 7. Ensure that "Cookies" is the only option selected and click "Clear Now". 8. Close the "Options" box by clicking "OK". 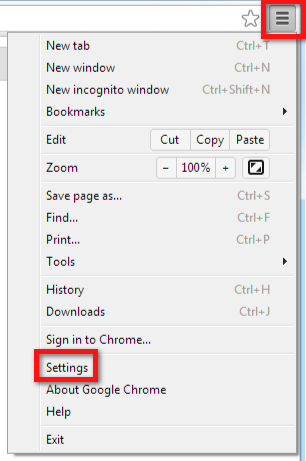 Google Chrome Settings Opening the Settings Page You can open the Settings page by clicking on the icon with three stacked horizontal lines to the left of the address bar; this will open up a dropdown menu, and Settings will be located to the bottom of the screen. Personal Computer Checklist (Google Chrome) RealPage, Inc.
Crownpeak Installation and System Requirements Configuration Guide Copyright 2000-2016 Crownpeak Technology Los Angeles, California, USA. All rights reserved. Crownpeak is a trademark of Crownpeak Technologies.